Eons have passed since the almighty clash between the titans Bionis and Mechonis. Having been locked in a timeless battle, the two titans poured their remaining strength into one last slash of their great swords and once the dust had settled only their two corpses remained. Since that time, life has begun to flourish upon the corpse of the Bionis which, with its lush plains, now plays home to a developed civilisation who continue to worship the titan for providing them with such a natural bounty. Three distinct races – the human-like Homs, elusive Nopon and the High Entia – all enjoy a peaceful existence but are soon threatened by an enormous horde of mechanical life forms called Mechons that launch a sudden, all-out attack on Bionis’ inhabitants. Xenoblade Chronicles begins a year in the past, with the player occupying the role of Dunban, Hero of the Homs, as he is seen utilising the power of a legendary sword known as the Monado to expel the Mechon invasion from Bionis. Said to be a gift from the titan itself, it is the only weapon capable of slicing through Mechon armour, having been imbued with a curious unknown power. The narrative is one of the most engaging aspects of Xenoblade Chronicles and, whilst I won’t go further as not to ruin any part of it, once you’re hooked you’ll while away the hours as you continue to discover more about the powerful Monado blade. Whilst you are able to purely plough through the story, at every turn the game also provides you with a range of varied side-quests. These encompass simple delivery/fetch quests, item collection, killing a number of a specified enemy type or pitting yourself against a mini-boss, for example. Although optional, they offer a necessary opportunity to gain extra money, experience or even items that will allow you to further strengthen your party. With such a vast, expansive world, it is important that players are granted the freedom to be able to traverse across it instantly when necessary, and in this regard, Xenoblade Chronicles excels. During your travels you will encounter numerous landmarks that not only grant you an experience, AP and SP boost upon discovery but also act as markers for you to ‘Skip Travel’ to. Of even more benefit is that rather than purely allowing you to travel directly to an area, the use of individual landmarks allows you to transport yourself to a specific location within it. A simple addition no less, but one that is noteworthy as an ingenious time-saving device. Navigating across environments is also clearly designated, with an arrow atop the screen pointing you in the direction of your next story quest whilst displaying the distance to your destination. The mini-map, or full-screen map if used, also shows the location of nearby Ether Crystals to mine, heart-to-heart opportunities (short scenes between characters that serve to enhance relationships and provide more back story), shops, landmarks and quests. 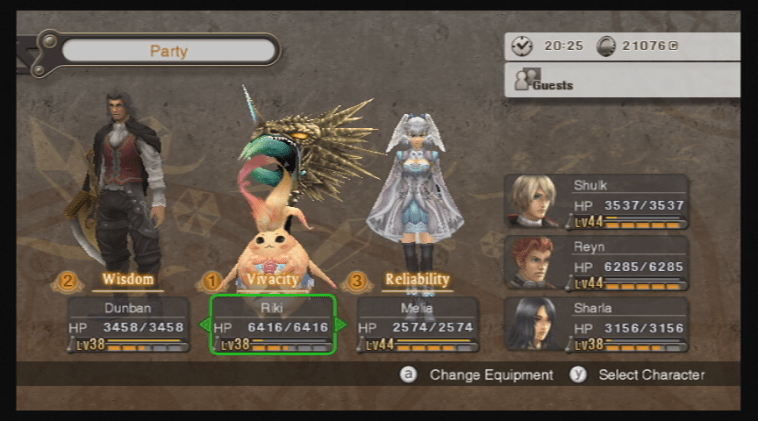 Xenoblade Chronicles’ strongest facet is easily its battle system. Perhaps familiar in some regards to that seen within Final Fantasy XII, enemies are visibly present on the landscapes that you navigate with players being able to choose whether or not to engage or to continue full pelt towards their objective. However, each has a varying ‘Sense Type’ such as Visual, who will attack you on sight, or Sound, who will attack you when they hear footsteps nearby. This means that in some cases you will either have to avoid getting too close to certain enemies if you wish to avoid them, or be prepared to hotfoot it in the opposite direction as they attempt to chase you down. Of course, in most cases, you’ll most likely want to engage such enemies in order to level up your party. In assisting you to see whether you stand a chance of besting your opposing foe, a colour coded ‘Danger Level’ is visible; ranging from Easy (Grey), Weak (Blue), Equal (White), Strong (Yellow) and Danger (Red). Battles themselves feel particularly fluid, despite feeling slightly overwhelming in places when larger quantities of enemies are engaged. Prior to combat, players are able to select their target using L and R before opting to attack their designated target. From here, an auto-attack feature means that you will continue to attack your selected foe if in range whilst you concentrate on employing the use of available ‘Arts’ and ‘Talent Arts’. These are visible within the aptly titled ‘Battle Palette’ at the base of the screen, and form a selection of circular icons each with their individual description beneath once highlighted. Once used you will have to wait briefly for such Arts to cooldown before being able to be used again. Whilst the majority of Arts are more attack-based, you’re also additional abilities to assist your party with health recovery and to inflict statuses on your enemies. Certain Arts also provide bonuses if used within specified circumstances – an early example being Shulk’s ‘Back Slash’ that allows you to deal more damage if attacking a monster from behind. Through effective use, these can allow you to dispatch enemy monsters quickly or even allow you to claw your way back from near defeat. 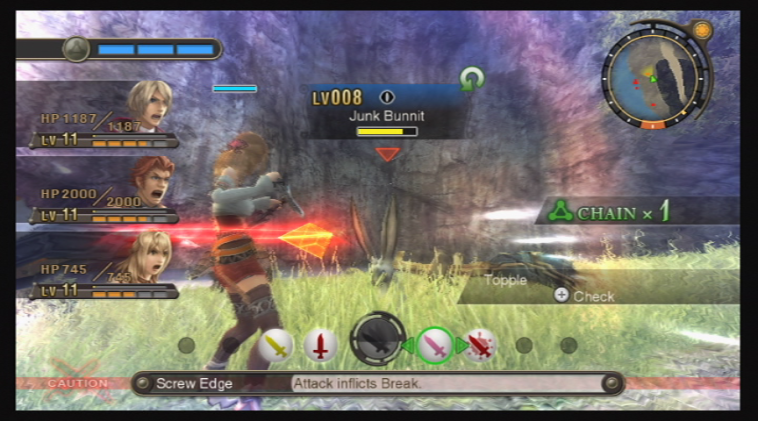 A fundamental aspect of combat is the power of the Monado weapon, once central character Shulk gains its use within the opening few hours of the game. Whilst being the only weapon that allows you to deal damage to the Mechon, it also provides the ability to perform a number of actions to aid your party when facing such enemies. During battles, you will be able to enchant the weapons of your party to also be able to damage such foes, for instance. Yet, more significantly, the Monado grants Shulk the ability to foresee upcoming enemy attacks that will greatly damage a party member. 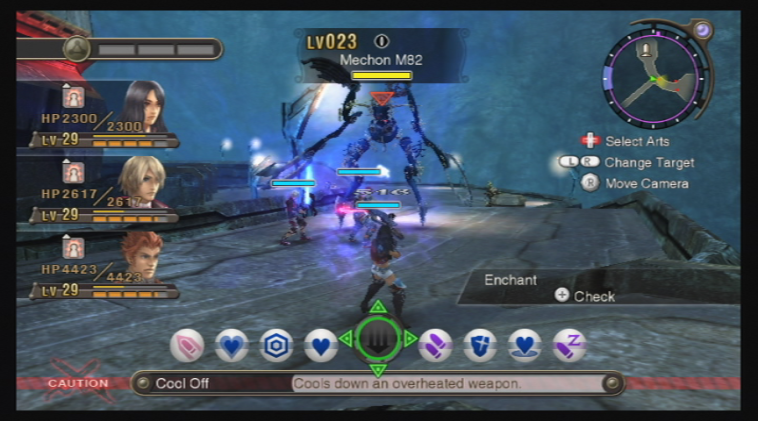 Once the vision has passed, you are then able to try to counter the attack before it occurs – visible by a decreasing bar at the top of the screen – by warning the threatened party member so that you can select a defensive Art for them to perform in order to protect themselves, healing them to prevent the attack from outright killing them, or using the power of the Monado to cast a shield to protect your party. 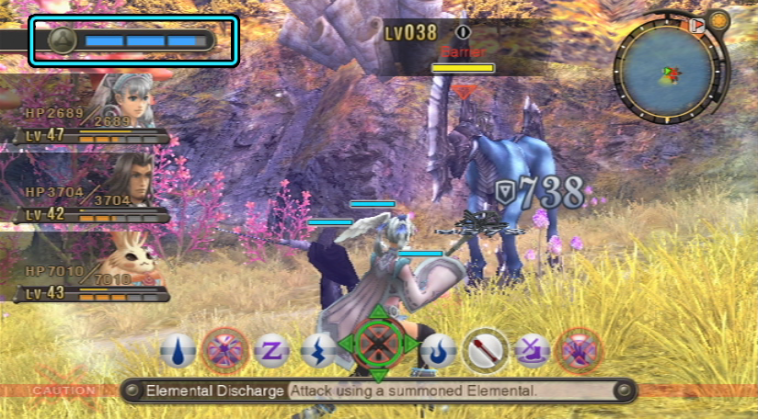 Battle instances also involve an ‘Aggro’ mechanic, which is the measure of a monster’s feelings of animosity towards each party member. The more damage that a monster takes from an individual party member, the greater the aggro towards that member will be, and in turn, the enemy will, therefore, direct their attacks towards who it deems is the largest threat. You’ll encounter Talent Arts, such as Reyn’s, that allow aggro to be drawn away from other party members, whereas Shulk is also granted an Art that allows him to reduce his aggro. It is imperative that you ensure weaker members of your party aren’t beset upon by a swarm of enemies, so the use of such abilities is a necessity. A ‘Tension’ mechanic is also implemented, ranging from panicked to focused with levels being visible through the expression of character portraits on-screen. With a high level of tension (focused) your party members will have a better chance of scoring a critical hit within combat and less chance of missing an attack. Those with low tension can be boosted by approaching them in battle and pressing B to ‘Encourage’ them, and similarly if a party member falls foul of a debuff or becomes incapacitated you’ll have to run across to them. It’s also worth noting that, in effect, there is no ‘Game Over’ within Xenoblade Chronicles. If defeated, either in combat or even freely jumping off the side of a cliff (! ), you are returned to the landmark that you last visited. Such design works well, as if you get stuck on a certain boss battle, for instance, you are then able to complete a few side-quests or grind by dispatching groups of enemies to level up before returning to have another attempt. Outside of battle, your characters steadily regain health automatically as well, removing the need to dive into menu screens to continually use potions and such like. Regrettably, despite achieving near JRPG perfection Xenoblade Chronicles isn’t without its blemishes. With all of the Wii’s graphical horsepower seemingly geared behind maintaining the open environments and the enemy creatures that inhabit them, an unnerving disappointment is the quality of the facial animation. With so many quests available, it is also easy to feel overwhelmed by the quantity at which you are able to amass within a short space of time. This is made more difficult by the fact that the on-screen pointer only designates the direction of the next story quest, rather than being able to be altered to guide you to the location of a selected side-quest. It is a minor irritation in some ways but relies too much on the player being able to work everything out by themselves. With the game targeting the broad Wii audience, such an element needed to be more accessible. Nevertheless, Xenoblade Chronicles stands tall as one of the best titles released in its genre this console generation. If there is one noun that is exuberated in every regard, it is depth. An engaging narrative, extensive quest system, and a rewarding combat system amounts to a phenomenal JRPG that is a not only worthy of your time and attention, but one of the most significant additions to the Wii software library.